Here is some advice to make recordings in good conditions. Before anything else, we need to prepare the recording session. We are not going to look for a melody, nor improvise or rehearse... we are going to properly record a song that we have already written. 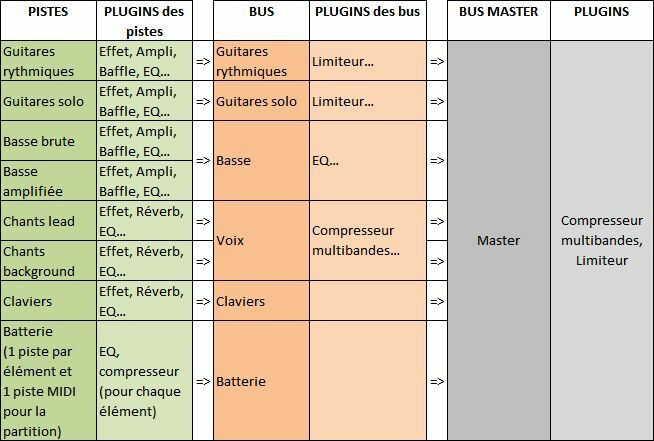 To avoid doing the same things over again each time I wish to record a song, I prepared a blank template which contains all the tracks and buses I need. I may naturally add or delete some elements if the template is not appropriate for the current project. What does my template look like? - One MIDI track on which the drum score will be placed. What is a track? what is a bus? Tracks are where you record an audio or a MIDI instrument. For instance, track 1 will contain guitar parts, track 2 will contain guitar parts of a second guitar, track 3 will get bass parts, track 4 will have vocals, etc. Everyone organize their tracks as they feel more appropriate. Buses do not carry recordings. They are groups of tracks. 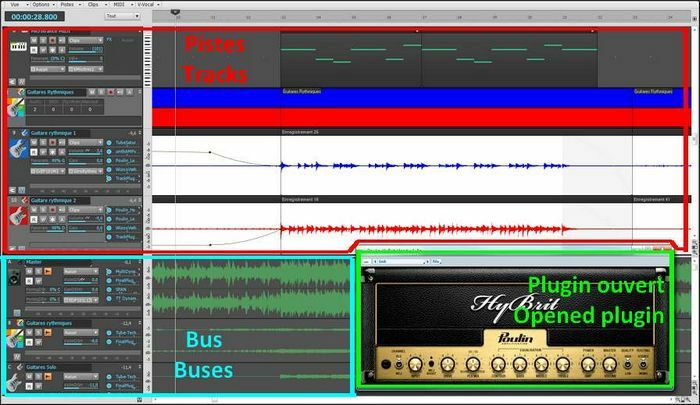 For instance, you can add a "Guitars" bus towards which you will redirect your guitar tracks. Thus, you may allocate common effects without adding these effects to each and every guitar track. Just put the effect on the bus, and each track will produce the desired effect. This will also allow you to mute all the tracks connected to a bus, or to solo them in one click. Again, you may organize your buses the way you want, and you will find the use of buses very convenient. Both tracks and buses can be either mono or stereo. In today's D.A.W.s, the number of tracks and buses you can create is not limited. Actually, the only limit are your needs, and the power of your computer's processor. The size of the "Tracks" and "Buses" windows can be modified at will. First of all, why start with the drums? The answer is simple, we will use drums as a metronome. The drums sound will guide us and help us follow the tempo. This will allow for an even recording and the song will not speed up or slow down unintentionally. Of course, variations can be interesting and bring some life to an otherwise mechanical tempo, but let's consider that a studio session seeks recording perfection, even though it's only a home studio. Each sample contains one or several "normal" loops and ends with a "fill" loop that will play at transition moments, like going from verse to chorus, or chorus to bridge, etc. This can help when recording. I put as many patterns as needed on my drum track, and I place a few additional bars (usually 2 are enough) at the very beginning in order to feel the tempo and start recording in tempo. These additional bars will be deleted at the end. Let's not forget we are recording in a home studio, in an appartment and it is simply impossible to play with a good old 100-watt tube amplifier, without the neigbors calling the police. So we are going to have to record the guitars and the bass directly through the audio interface. No real amplifier, no microphones involved. The latter solution would be preferable, but on of the benefits of direct recording, coupled with amplifier simulators, is that you can always edit the sound later, without having to re-record. Just change the settings and you're done. So now... bass or guitars first? There isn't one clear answer. Bass and drums are the foundation, the rhythm base of a song and everything else should rely on them. But other factors could also be taken into consideration: for instance, the person recording may be more comfortable with a guitar than a bass, and will rather play guitar first. Or maybe the song has a very important bass riff that compels you to record it first. In any case, you are the one who can decide. If you are uncertain, then the drum / bass duo is a safe bet. If this is in place, then the rest can easily be added. Guitar or bass, the recording process will be the same. Plug your guitar into the pre-amp, the pre-amp is connected to the audio interface (or plug your guitar directly into the audio interface if using the interface's pre-amp), and set the recording level. This is very important! Before recording anything, check that you are not going to go beyond the maximum level (0 dB, zero decibel). In a home studio, you won't have a sound engineer besides you to make adjustments on the fly, while you are playing. You are the one to take precautions. How can you do that? Simple: try and adjust, it doesn't take long and will prevent you from making a perfect take, then realize the levels were too low or too high, forcing you to do it all over again. Have a try: for a rhythm guitar for example, play the loudest parts and set the preamp and audio interface volume levels in such way that when you play the loudest, the recording level doesn't go beyond -6 dB. The absolute maximum that you should not reach or go beyond is zero dB. 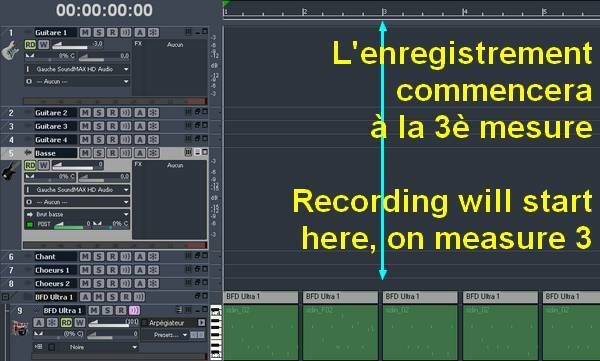 If you play in your try the same way you play during the actual recording, then you can be certain the recording level will be correct. If your average level is between -9 db and -6 dB, then your level is sufficient and you have a margin of error before clipping. 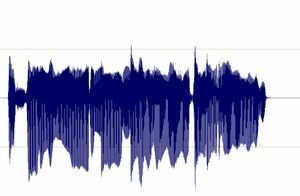 If you zoom in, you can see that the right curve is beheaded, anything that goes beyond 0 dB is crushed. Why is that wrong? Because the sound gets distorted, saturated. And you should avoid this, unless you voluntarily seek to give a headache to your listeners. Alright? Your levels are checked? Then go for it, record your guitar and bass tracks. Set your guitar as you wish by using the bass, treble and microphone buttons. Try to avoid very low sounds (muffled) or very high sounds (shrill). The sound you record should be pleasing to the ear. Remember that, when mixing time comes, you won't be able to magically bring to life what was not recorded in the first place. A high-pitched sound will never produce a warm low sound, even by tweaking the knobs. So think in advance what you wish to obtain in order to choose your sounds in a coherent and logical way. Now stay in tempo and if you make a mistake, start over. Once the song is complete and starts spreading around you, it will be too late to regret a bad take. So do things well now. Not everybody is as talented as Jimmy Page (Led Zeppelin), Eric Clapton, Slash or Matthew Bellamy (Muse) and everybody can make mistakes. There is no emergency, and if you have to record the same take 30 times, do it. Do and re-do until you are fully satisfied. Record and carefully listen to the take, especially if your think it's the right one. Regularly save your project. You never know if your computer will crash and make you lose hours of work. If this helps, record with the guitar sound you chose (see amplifier simulators), but for the time being, what counts is the quality of the recording, not that of the amplifier sound. This is what's so great about the amp sims, you can edit the sound whenever you want. We'll see that later, when mixing. OK, you have now recorded all the guitar tracks you needed. Maybe your song requires only one track, or maybe you needed 8 tracks, that's up to you to decide. It can be interesting to double the takes, in order to thicken the sound. But remember, the more instruments and tracks there are, the more difficult mixing becomes, because it's more complicated to have all instruments coexist. 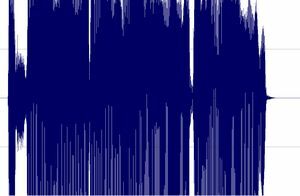 Looking for a "bigger sound" doesn't necessarily requires multiplying the tracks, it can also be achieved by using the appropriate effects. Of course, the bass is also a guitar (a bass guitar...), so the recording constraints are identical to those of the guitar. Check your recording levels to avoid clipping, and above all, stay in tempo, or the song will sound shaky. I prefer to record them last but there are no rules. If you prefer to record them first, then do so. To record vocals, make sure the place is quiet, shut the door, tell the people who live with you to be quiet, and do not record while your neighbor is drilling holes through his kitchen walls! Also, turn off your monitors and use a headset instead to avoid recording the playback with your microphone. Dynamic microphones are solid, they don' need a power source, they can take heavy acoustic pressure (like a kick drum or a saxophone) and they are not too expensive. They are also less sensitive to surrounding noises than condenser microphones. The cons are they lack clarity in the high range, which renders takes less clear and defined than with condenser microphones. 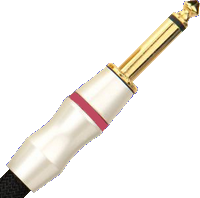 They can be used with Jack or XLR plugs. Condenser microphones are much more responsive and accurate. Their high sensitivity is double-edged, because they will capture any noise when recording. The fans of your PC are noisy? Chances are this noise will be recorded. Sound comes out of your headset? It will be recorded by your condenser microphone. Children are loudly playing outside? You might get that too. 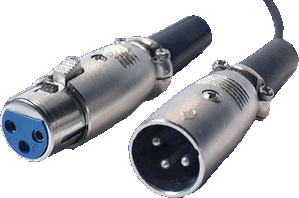 However, some condenser microphones are called "cardioid", or "hyper cardioid", and they only record what comes from a specific direction, ignoring (more or less) other sound sources from other directions. On the contrary, omnidirectional microphones record what comes from anywhere. Not ideal for a home studio. Condenser microphones are also more fragile (don't knock them) and must be powered through a "phantom power", whose standard is 48 volts. This kind of power is either present on your audio interface and can be turned on and off with a button, or it will require the use of an external phantom power source that you will then connect to your audio interface. You have to use 3-pin XLR plugs that carry the phantom power current. Finally, condenser microphones are usually rather expensive, some of them cost several thousand euros (or dollars, or pounds), but only professional studios or rich amateurs can afford those. On the plus side, the sound you get with a condenser microphone will have the best quality. Be cautious though, a good dynamic microphone is worth better than a bad condenser microphone. No big secret here, for microphones like for anything else, very low prices are rarely synonymous with good quality. Some pieces of advice: buy a microphone stand and a pop filter (you can also make one yourself with wire and a piece of tights from your wife / girlfriend / mother / daughter / neighbor). The stand will prevent you from manually holding your microphone and thus produce handling noises. As for the pop filter, it prevents the air to hit the microphone and produce unwanted blowing sounds when you pronounce some letters such as "p" or "b". Furthermore, try to stay in front of the microphone when you sing, don't move from right to left or back and forth in order to avoid big volume variations. Dynamic microphones will not record you correctly if you stand too far from the microphone (8 inches, 20 centimeters would be a lot, meaning you can easily go too far). Don't let this piece of advice prevent you from "feeling" your song. If thinking about your position prevents you to have emotions, just forget about it but try to remember that the less you move away from the microphone, the better the quality. Nevertheless, if you have to really scream all of a sudden (I think about Frank Black from the Pixies, who goes from whispering to howling in an instant), you should then step back from the microphone in order to avoid clipping. Just like the guitar recording, you have to set the recording level of your vocals before the take. Have some tries and check once again that the level doesn't go beyond 0 dB. 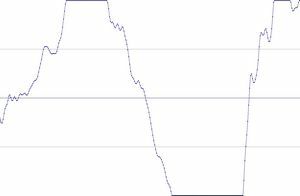 Now, if you plan on having very different volume levels, using the howling moments as a reference will render the quiet moment barely audible. So, either you live with that (but you could bring some noise when compressing the quiet sounds during mixing), or you make several takes, with different level settings for the quiet and loud moments. You can also get the help of a friend who knows the song and will manually adjust the levels on the fly. I also advise you stand up when recording vocals. Singing while sitting is a bad habit, as it prevents you from breathing deeply and could compromise your vocal amplitude. When standing, singers can better "live" their song. Look at studio recording videos: singers stand. Not only because it looks nice on the video, but for breathing reasons. Also think about carrying your voice. I am not saying you should scream (unless it is required in the song), but you should carry the voice. If you're mumbling, people will hear it. Think of Mick Jagger, David Bowie, Elvis Presley or Freddy Mercury, they carry their voice. You can clearly hear when they refrain, then just let go. So let go, let your future listeners feel that you gave it all, that you lived your song. But once again, unless it is voluntary, do not force it. You are not taking part in a shouting contest!!! Unless you have a natural gift (and even then...), be aware that singing requires work to be mastered. Nobody becomes a great singer without practice. Do not overestimate your capabilities. Each of us has a singing range (tessitura) that can only be broadened through training. 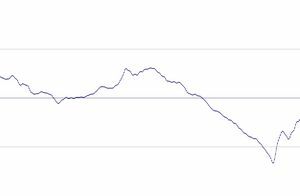 This is the range of notes one can sing, from the lowest to the highest. Needless to sing a note that is too high-pitched for you. If you cannot reach it (not yet), forcing won't help you much. At best, it will sound awful, at worst, you'll damage your vocal cords.